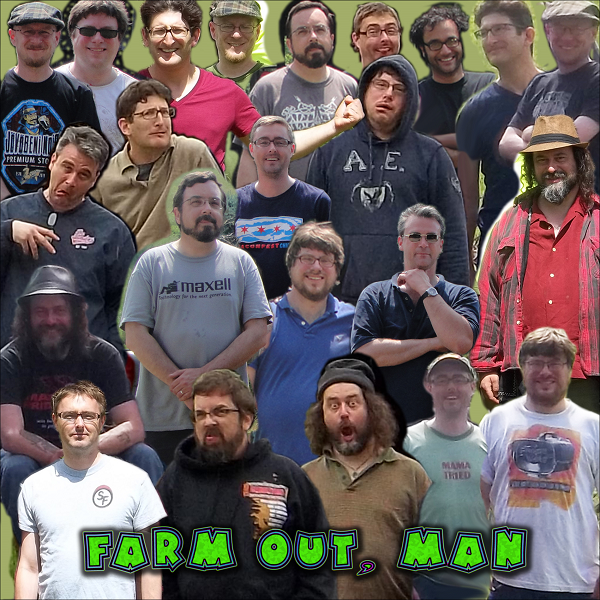 Farm Out, Man is a collection of some of the best outtakes from the first 5 Farm Jams. 1: Heat Rash (1:43) Rating: 4 Record date: 05/25/2012 AAD by Brian McNally Copyright © 2012 The Sheep Fiends Foundation. 2: Be Prepared (3:42) Rating: 4 Lyrics by: Brian McNally Record date: 05/28/2011 AAD by Brian McNally Copyright © 2011 The Sheep Fiends Foundation. 3: 35 Degrees Of May (3:33) Rating: 4 Record date: 05/25/2013 AAD by MX Skroch Copyright © 2013 The Sheep Fiends Foundation. 4: Chapter And Verse (5:35) Rating: 5 Lyrics by: Sid Prise Record date: 05/23/2014 AAD by Brian Cameron Copyright © 2014 The Sheep Fiends Foundation. 5: The Clearing (3:49) Rating: 5 Record date: 05/29/2011 AAD by MX Skroch Copyright © 2011 The Sheep Fiends Foundation. Note: That's Brady on the lawn mower. 6: Knitting With Stolen Needles (2:26) Rating: 4 Record date: 05/25/2012 AAD by Brian McNally Copyright © 2012 The Sheep Fiends Foundation. 7: The Bloodline (3:05) Rating: 4 Lyrics by: MX Skroch Record date: 05/26/2013 AAD by MX Skroch Copyright © 2013 The Sheep Fiends Foundation. 8: Dreaming Of Dreadlocks (2:56) Rating: 4 Record date: 05/25/2013 AAD by MX Skroch Copyright © 2013 The Sheep Fiends Foundation. 9: Can Full Of Bees (3:23) Rating: 4 Lyrics by: Brian McNally Record date: 05/29/2011 AAD by Brian McNally Copyright © 2011 The Sheep Fiends Foundation. 10: Stella On The Fire (3:28) Rating: 4 Record date: 05/26/2013 AAD by Brian McNally Copyright © 2013 The Sheep Fiends Foundation. 11: Dreams Versus Fire (4:20) Rating: 5 Lyrics by: Matthew Cramer Record date: 05/23/2015 AAD by Brian Cameron Copyright © 2015 The Sheep Fiends Foundation. Note: Some lyrics were overdubbed. 12: The Junebug (2:58) Rating: 4 Record date: 05/29/2011 AAD by MX Skroch Copyright © 2011 The Sheep Fiends Foundation. 13: Burnin' The Barn On The Farm (4:53) Rating: 4 Lyrics by: MX Skroch Record date: 05/24/2015 AAD by MX Skroch Copyright © 2015 The Sheep Fiends Foundation. 14: Pennsylvania Settlement (3:12) Rating: 4 Record date: 05/27/2011 AAD by Brian McNally Copyright © 2011 The Sheep Fiends Foundation. 15: Snow White And The Seven Fiends (6:46) Rating: 3 Lyrics by: Matthew Cramer Record date: 05/25/2013 AAD by MX Skroch Copyright © 2013 The Sheep Fiends Foundation. 16: Morning Of The Day Of The Sun (4:57) Rating: 4 Lyrics by: MX Skroch Record date: 05/29/2011 AAD by MX Skroch Copyright © 2011 The Sheep Fiends Foundation. 17: Aftertime (3:36) Rating: 3 Lyrics by: Brian Cameron Record date: 05/25/2013 AAD by Brian Cameron, Brian McNally Copyright © 2013 The Sheep Fiends Foundation. Note: The vocals were overdubbed, singing much the same but correcting for a bad original vocal recording. 18: Daytime Dashiki (3:30) Rating: 3 Record date: 05/26/2012 AAD by Brian Cameron Copyright © 2012 The Sheep Fiends Foundation. 19: As The Rest Were Resting (3:11) Rating: 3 Record date: 05/29/2011 AAD by MX Skroch Copyright © 2011 The Sheep Fiends Foundation. 20: Mirage Hill (2:02) Rating: 4 Record date: 05/27/2011 AAD by MX Skroch Copyright © 2011 The Sheep Fiends Foundation. 21: Farm Jam Fading (5:00) Rating: 4 Record date: 05/26/2013 AAD by Brian Cameron Copyright © 2013 The Sheep Fiends Foundation.